The stories of Jesus are familiar to most of us. We could easily think that we are finished gleaning any new wisdom from them. The good news is that this living story, with its living characters, is never finished with us. Just when we think we have heard it all before, we find a passage that challenges us. We turn a page and hear our own voice mingled with those of the disciples around the table who ask Jesus, “Is it me?” We read about the woman anointing Jesus with oil and wonder what extravagant gifts we give because we love God. Each time we encounter this Gospel, Christ confronts us with the opportunity to find a path forever new to us and follow him on it. Brett Younger is associate professor of preaching at Mercer University’s McAfee School of Theology and has pastored churches in Indiana, Kansas, and Texas. Carol Younger is the program director of religious life at the United Methodist Children’s Home in Decatur, Georgia and has served on church staffs in Virginia and Kentucky. Brett and Carol enjoy life with their sons Caleb and Graham. The Youngers have been partners in ministry since 1983 when they met in seminary and have co-authored Living with Stress: Nurturing Joy in a Tension-Filled World. He is the author of Who Moved My Pulpit? and co-writer of the Formations Bible study commentary for Smyth & Helwys. She has written extensively for Smyth & Helwys Bible study curriculum. The Teaching Guide includes suggested worship outlines for both traditional and contemporary worship services, approaches for leading group discussions, and teaching plans for adults, youth, and children.. 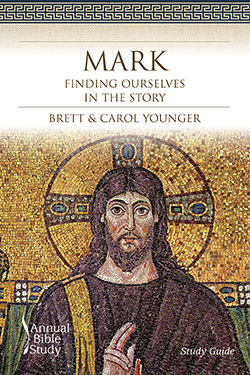 The Study Guide helps learners understand the biblical background of Mark’s Gospel, how to interpret it, and its basic theological themes. Each session features thoughtful questions for reflection and discussion.